These "October Horror Movie Challenge" threads are for the discussion of the films in the 31 FILM SUBSET. I knew I owned this but couldn't find it until I happened to stumble upon my Vincent Price collection boxset. Theater of Blood earned a well deserved place on Rotten Tomatoes' top 75 rated horror movie list this year. I first caught this on TNT late at night (I think part of MonsterVision with Joe Bob Briggs) and it holds up very well. The pacing is great, starting strong and keeping timing with an frequent inventive kills. Vincent Price gives a blistering performance and strong production values make what could have been a flat script sizzle. Apparently Vincent Price was having an affair with Carol Browne (character Chloe Moon) during filming. Imdb says 2005 ToB was turned into a London stage show. Speaking of MonsterVision, while looking for video of a ToB stageplay, I found these cool Joe Bob Briggs segments from the ToB on YouTube, probable spoilers... Segment 1, Segment 2. Segment 3. The motley assortment of homeless people helping Lionheart are a nice touch adding to the gallows comedy. My favorite kill is the the purple clad critic who is served his dogs in a pie then force fed them. Last edited by Undeadcow; 10-25-11 at 02:46 AM. I like the flourishes in the film inserted for the Bard-savvy, for example in the opening scene a white van marked "Shakespeare Removers" us seen through a window and then the camera focuses on the word SIGNS in a newspaper headline, which is relevant to the first murder when the death of Caesar is foretold by signs and wonders in the streets of Rome. Later, a critic doomed to drown in a barrel of wine like George, Duke of Clarence in Richard III, enters a shop marked "GEO. CLARENCE" to what he thinks is a wine tasting. It's one of my favorite films, and contains some of Price and Rigg's best work. I remember first reading about this film in Famous Monsters. Randy Palmer had written an article called "R is for Revenge," in which he detailed the plots of three Vincent Price films that all had revenge as a motif: The Abominable Dr. Phibes, Dr. Phibes Rises Again, and Theater of Blood. Because The Abominable Dr. Phibes was one of my favorite films at the time (and still is, for that matter), the article became my favorite ever published in FM and I was determined to track down Theater of Blood and watch it. (Years later, when I was living in Old Town Alexandria, Virginia, I became acquaintances with Randy Palmer, and I told him how much his article had meant to me in my youth.) When I finally saw Theater of Blood, I was a little disappointed. I felt (and still feel) that the first Phibes film is the superior film. My opinion has mellowed over the years, however, and I enjoy Theater of Blood now...but it's no Phibes. This was a first time viewing for me and while I enjoyed the film there were several times that I thought about how similar in structure it is to The Abominable Dr. Phibes, which just seems to be more fun to me. 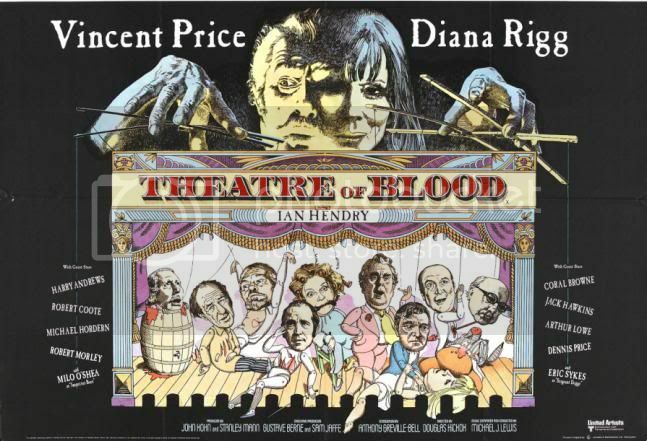 I did like many things about Theater of Blood including the pacing, the supporting cast (especially the feisty crew of river folk who both helped and hindered Lionheart and of course the ever lovely Diana Rigg), and the nicely plotted, often bizarre murders. Some of the humor worked for me but some also fell flat. The Lionheart character seemed to me a bit generic, although I think that was more the script's fault and that Price got everything he could out of what he was given. All in all I found this to be a satisfying, enjoyable movie but nothing really outstanding. Having not seen this one before, I was also struck by the Phibes similarity, which is one of my favorite Price films. After seeing Theater of Blood, I'm not sure which one I prefer. I think I might give Phibes the edge just because of how bizarre it is, but this was certainly a better showcase for Price. But regardless, I loved this movie! I was really taken aback by the opening kill. It was far more vicious than I was expecting and very effective. The humor was also great. There were a lot of subtle and not so subtle moments that brought me to laughter. Probably the line that got the biggest laugh from me was, "Only Lionheart would have the temerity to change Shakespeare." There was also something in the expressions that Price gave Rigg during the decapitation scene that made me laugh. Then I laughed even harder at the reveal of the murder for the wife and housekeeper. It took me a while to pick out that Rigg was the guy with the mustache and curly hair. I can tell you that the moment I realized it was her; it was when the guy was arriving for the wine tasting. I believe it was right after a flashback (I think of Lionheart's "death") and right before Lionheart's Richard III speech. Suddenly it hit me who she was. Really strong performances from both Rigg and Price. They worked so well together. This is one I'm going to have to share with some friends. I think they'll really enjoy it. Oh, and here's the obligatory "they really should release this on Blu-ray." And they should because I would buy it. But now that I think about it, are there any Blu-ray releases of any Vincent Price films? Now that I think about it, I'm not sure I could name any that are. And no, I'm not counting Edward Scissorhands. Dr. Phibes put me to sleep the first time I watched it. That being said, I didn't enjoy it that much in the beginning but then my wife joined in, and we watched it over dinner, a little over halfway through and then it was more fun. She ended up losing her appetite due to the the food kill. Price used to say that when word of the plot -actor kills critics- got out, actors were clamoring to be part of the project, hence the great supporting cast of British character actors. This is one of my favorite Price films and I pick up something new every time I watch it. Last night it was Price saying to Rigg "Give me a basin" in the decapitation scene and her handing him a chamber pot. I also noticed that the scene in which Price is betrayed for a drink by one of his minions is an homage to a similar scene in HOUSE OF WAX. I'm sure if I went back over it carefully, I could find other shoutouts to other Price films. Perhaps I'll do that on my next viewing. BTW, when the film was made into a play, Jim Broadbent played price's part and Dianna Rigg's daughter played his assistant. Thanks for pointing those out. I love interesting trivia on films, especially ones with favorite actors like Vincent Price.